Will Sharpen, Inc. provides a superior sharpening service of scissors and beauty shears for dog groomers, veterinarians, barbers, beauticians, and other professional workers. In addition to regular scissors and beauty shears, we also sharpen industrial scissors, pinking shears, sewing scissors, and veterinary scissors, to name a few. We are pleased to announce that we have expanded our mail-in sharpening territory to include Hawaii, Alaska, and all US territories. We will continue to stand by our low flat rate shipping fee; no additional shipping fees will be applied to sharpening orders within these locations. See our service pricing page for more details! Will Sharpen, Inc. is certified by Bonika Shears to sharpen their beauty shears. We have also received special training by Wolff Industries to sharpen scissors and continue to pursue periodic training from other knowledgeable sources. Though we have been in business for over 30 years and the quality of our service speaks for itself, we are always working to improve our service to our valued customers. We are certified by Kuda to sharpen on their sharpening equipment and specially trained by Kuda for sharpening using the torsional edge method. The benefits of the tortional edge method we use to sharpen scissors and beauty shears is multidimensional. Whether you are a beautician, stylist, or dog groomer, the scissors or beauty shears will cut and perform the way they were intended to from the factory. You will be able to perform slide cutting with the main body of the blade, and be able to blunt cut and chip with the tips. You can expect your scissors and beauty shears to be sharper than new, but maintain the factory "feel" that made you purchase them in the first place. More importantly, you will benefit from the fact that less metal is removed while servicing your scissors and beauty shears. This will greatly extend the life of your treasured tools. We understand that your reputation relies on the quality of your tools. That is why we not only offer quality sharpening services and routine preventative maintenance with every order, but we also ship your scissor sharpening and blade sharpening orders back to you within three (3) business days from receiving it. With higher quantity orders of industrial shears, the return time may be a little longer than three (3) business days, but we are confident you will find our quick service to be satisfactory. We understand the importance of fast, reliable service, and we strive to treat you and your tools responsibly. Please be sure to pack your scissors and beauty shears securely and protected when shipping your tools for our blade sharpening service. There should be no rattling! We do business the old fashioned way, with honesty and integrity, only we do it with the latest technology. Our goal is to glorify God and to offer you the same, or better, quality of service that we expect of other companies. That is why our scissor sharpening and other work is guaranteed. 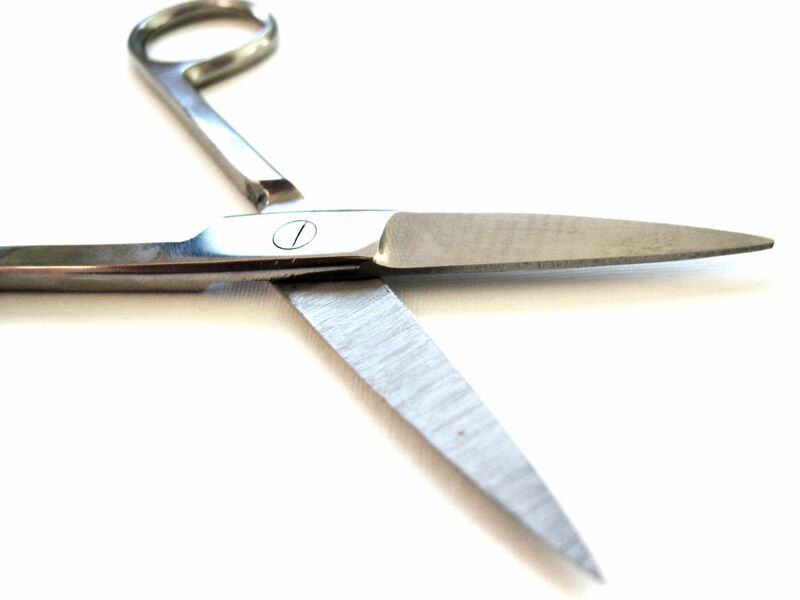 If your beauty shears or scissors do not cut properly upon opening them, we will re-sharpen that item on your next order. Just contact us as soon as possible if you encounter any problems. You may also want to consider purchasing new scissors or beauty shears. Check out our storefront pages for our pet grooming shears and beauty shears. 1. Enter quantity of each scissor or shear type being sent for sharpening. 3. Once finished shopping for service & storefront items, go to checkout. Secure the tips of your scissors and/or shears with a rubberband so the blades will not be damaged in shipment. Also, pack them securely; there should be no rattling or shifting in the package. If you choose a check as your payment method, please enclose the check in your package. Note: If you would like to insure your package, please do so. We are not responsible for lost or damaged packages in transit to us. We also provide the option of insuring the return shipment of your sharpening order. 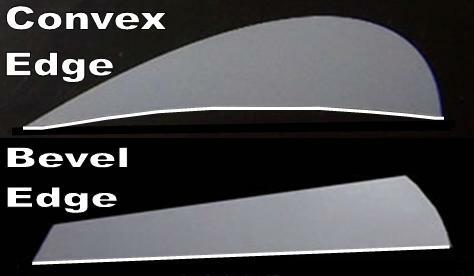 *To determine if your shears or scissors are convex or bevel, please refer to the images below of cross-sections of the blades that show the difference between them. For more information, review the FAQ page. WillSharpen will bill or credit you the difference in cost if you choose the incorrect style of sharpening. If you would like to talk to someone before ordering, please fill out a contact form and include a phone number or call us at 1-800-218-1827. We also sharpen industrial shears! Please contact us for pricing and quantity discounts. Call 1-800-218-1827 for quantity discounts on Industrial Shear Sharpening.